Kaizen means different things to different people. Some see Kaizen as part of the Toyota Production System, or the essence of Lean. 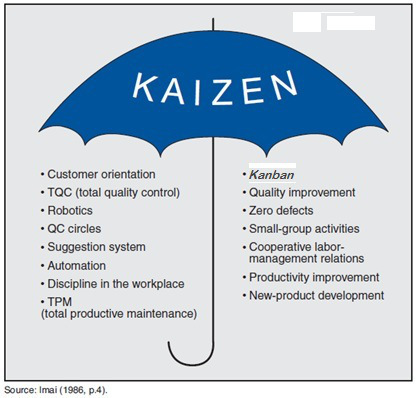 Some have positioned Kaizen as the umbrella concept of Lean or Six Sigma. Others view it merely as a set of techniques or practices. Meanwhile, it is also seen as a leadership style or culture. Toyota see it as the “soul of the company”. To me Kaizen is a pan-organisational attitude and questioning mind-set, which fosters co-creative betterment. Kaizen is fundamentally very simple. It’s nothing more than everyone (in an organisation) asking themselves a single question every day, everywhere they work: “What small step can I take to improve …. (whatever they are working on)?” The emphasis is on small, i.e. it is easy and immediate to implement. For example if you want to lose weight, reducing one lump of sugar in your coffee would be a small ‘doable’ step – as opposed to the big step of going on a full 2-month cruel diet. The Kaizen mind-set is so easy to explain, yet difficult to apply in many corporate settings. Kaizen is normally translated as ‘continuous improvement’, and indeed that is its effect, continuously improving the workplace, product, processes and so on, little by little. 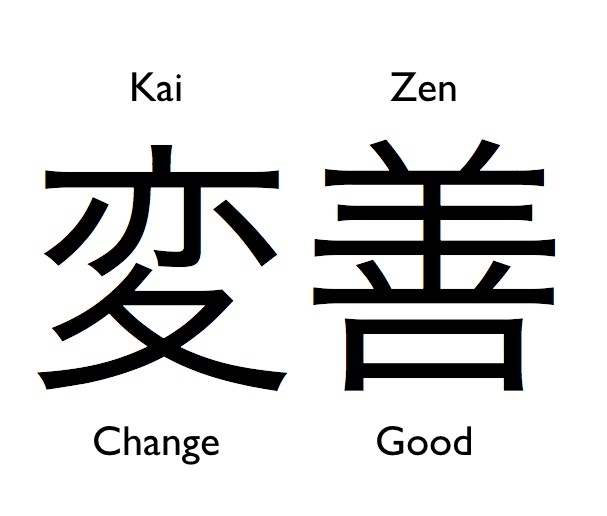 The literal translation of ‘kai’-‘zen’ is ‘good change’ (kai, kaeru = change; zen, yoshi = good), or change for the better. Indeed, strictly speaking the word Kaizen does not actually say anything about small or continuous. Masaaki Imai, who initially introduced Kaizen (as applied in Japanese companies) to the West further adds: Good change “by Everybody, Everyday, Everywhere” – and this is crucial, just little incremental steps but done by everyone regularly (continuously). Kaizen is not just about improving products or services; it is also about constantly improving processes (operations, standards, office workflow, production, efficiency, sustainability…..), indeed anything that may speed up, embellish, eliminate waste, simplify, reduce a step, remove toxins, fool-proof a process and so on. Kaizen is particularly useful in reducing human mistakes in routine work, by considering small steps that would prevent human errors recurring. We all sometimes do some simple Kaizen without knowing it, for instance in the kitchen we may move things around to make it easier to cook. Indeed we often treat our homes with a kaizen mentality in a way we don’t in the workplace. Where many people work in the same place, however, some form of standardisation is required; we cannot implement ideas willy nilly, it needs the consent of all affected. In a Kaizen workplace small Kaizen meetings are encouraged to consent to and implement these small changes – which are then also jointly celebrated, and periodically reviewed. Organisationally Kaizen is about culture, a ‘Kaizen culture’. Kaizen has more to do with human encouragement and development (‘hitotsukuri’) than with improving the service or product of the organisation (‘monotsukuri’). It represents personal development, but not in the abstract, rather it is totally connected to the work being done. Put the other way round, although Kaizen is deeply connected to the workplace, its products and processes, it fundamentally celebrates the human side, the personal and professional development, of all the organisation’s employees. Kaizen encourages improvements by everyone, everywhere, all the time. Everyone is involved in Kaizen activities, from the top of a company (role model) to the office or shop floor, where the work is done. A Kaizen culture forces managers to actively encourage small improvements, to listen to ideas, and to enable them to be implemented. Even where there is no immediate financial gain, if it improves the working environment, it helps create happy employees, increased motivation and more engagement, which in the long run are more productive. Everyone does Kaizen – a manager’s job is to create conditions so that Kaizen can happen, an innovation platform – absolutely everyone at all levels and stations is encouraged to think autonomously and creatively. This means all employees are listened to, appreciated and respected (and this ties in well with the Gemba philosophy of ‘go see, ask why and respect’). Contrast this to organisations where views of subordinates are ignored, with a “that’s not your job” or “we’re already taking care of that”, or even if they are heard, managers tend to then step in and interfere or micro-manage; this in turn irks staff and engenders an attitude of ‘why bother?’ or ‘whatever!…..’. Kaizen is practiced at every level of organisation, all are involved – a structured yet liberating approach. “A leader must lower himself like water and give credit to his subordinates. If he wants to take credit, they will leave him soon. If a leader frequently interferes with subordinates, they will protest. A leader’s job is to create an atmosphere in which they want to do (work) for themselves with enthusiasm and can fulfil their potential.” Lao Tzu, Tao Te Ching. Kaizen is often contrasted to Innovation – representing the big steps, the big leaps, the mega ideas. Innovation is more dramatic and produces spectacular improvements (though not necessarily sustainable). Innovation and Kaizen can be compared to the hare and the tortoise, the hare being innovation running fast with big leaps, the tortoise little steps one step at a time. Both are required. Kaizen takes a far more long-term view, there are no immediate results and so it cannot be tied to performance targets. For that reason Kaizen is often ignored in the West. But like compound interest, invisible to begin with, the benefits are enormous in the long run. Both Kaizen and Innovation must prevail: while it is imperative that everyone is involved in small incremental Kaizen activities to create a change-ready platform, sometimes outright disruptive innovation, out-of-the-box thinking, is also needed to avoid the situation of constantly improving the wrong things, e.g. out of date products – for example continuing to refine the fax machine is largely going to be futile. There is a potential danger to watch out for where Kaizen ends up stifling innovation – radicalism is sometimes also needed. Kaizen works well for performance-improving innovations (product upgrades) and efficiency innovations, whereas out of the box innovations are better suited to market-creating innovations. Innovation gurus sometimes argue that management should not be ‘bogged down’ by ‘petty’ minutiae of Kaizen. But there is a difference between taking an interest in other people’s ideas and micro-controlling them – Kaizen is about encouraging people to have ideas and take initiative independently in the context of the organisation’s aims, it’s not about managing those ideas top down! Yes Kaizen may be the petty cash, while innovation are the big notes. However petty cash is the bread and butter of innovation and if ignored or belittled, one risks stifling innovation, too. The issue is not about whether it is innovation OR Kaizen. BOTH should co-exist and complement each other. Kaizen and innovation are different sides of the same coin. It is not one or the other, both should be applied in a complementary way. While innovation can achieve big leaps, what Kaizen does well is enable a plethora of small stress-free improvements in all areas of an organisation by all employees to emerge, and this sustains continuity and motivation of the whole workforce. Does Kaizen work outside of Lean? It is somewhat ironic then that Kaizen as applied in organisations was first articulated by the American W. Edwards Deming. He asked Japanese workers to think every day ‘what is one small step you can do to improve the product or process?’ – Deming was talking to the right people, they valued the small tortoise-like approach (whereas his ideas were considered largely irrelevant in America). The Kaizen questioning mind found a natural home and popularity in Japan. Kaizen later spread to the West via Toyota’s successful Toyota Production System (TPS), where it was implemented as part of Lean Management practice. Actually Kaizen is independent of Lean. Because of its association with Lean, however, it has not really found such a foothold in the West outside of Lean as one might expect. Nevertheless, Kaizen can be applied to any form of organisational platform, whether Lean, Agile, Conscious, sustainable or Sociocratic, as well as outside work in healthcare, family and self-development. So, what small step can you take to improve your product, your process, your life, your health, your wealth, your relationships, your ….? Kaizen applies both within work, organisations and personally in life. Coupled with Lean, however, Kaizen employs the same tools as for problem-solving, like the 7 quality tools, PDCA, 5-whys, 5-Ss (visual management), A3-thinking and Horenso (bottom up communication) etc. In larger organisations dedicated Kaizen teams are there to support the implementation of Kaizen ideas (to build little jigs etc.). But the most fundamental tool is the daily discipline, like exercising daily for 5 minutes, of simply asking the question what little steps can you take to improve the work – and this is encouraged by both superiors and peers. Because Kaizen ideas are small steps, they can be tried out, experimented with and further improved – and if in the end they don’t work as expected they can be dropped, all done in a playful tone. Experimentation is important: mistakes are not only allowed and unpunished, they are actively encouraged in a spirit of trying things out. Even where more experienced staff can see juniors, for instance, making errors, their job is not to stop them – on the contrary people only learn from their mistakes, so it’s important to let them ‘fail’, in the spirit of learning. Their only job is to contain the scale of the error, to avert major harm. In the Kaizen spirit of keeping things small, this is simple. Little steps are easy to enact and they eliminate fear (which is the enemy of creativity). Kaizen is well aligned to the plasticity of the brain, with multiple cells each doing a bit: neurologists call it mind sculpture. Asking the simple question of ‘what one small thing can I do to improve the work?’ trains the cortex in looking for solutions rather than blame. This promotes collaboration, team spirit, and a positive attitude. Consider the difference between ‘what little step can you think of to improve your workplace’ with ‘what major contribution can you make to improve the bottom line of company’ – the latter being fear inducing. So why is Kaizen so difficult to implement in the West? Kaizen requires self-esteem (to overcome the urge to want to achieve mega-results by yesterday), optimism (belief that it will contribute to something larger at some point) and a common vision or purpose for Kaizen take you to. You cannot control the size of the result by controlling the size of the step – yet that is precisely what many managers try to do. Kaizen is possibly not suited to a command and control culture or a top-down business improvement culture; however, times are changing, and as leadership evolves and becomes increasingly distributed, so Kaizen will find a more natural home here too. c) management only paid lip service to Kaizen, thus starving its potential. Kaizen needs to be supported at all level to succeed. Kaizen is a mind-set, and a mind-set cannot be imposed or mandated. But it can and should be encouraged and nurtured, and given the freedom to flourish. Kaizen and innovation, while different, are not exclusive – on the contrary they should work hand in glove. Everyone does small steps regularly, ideas build up on ideas with a compound interest effect, and innovation grows exponentially. Some ideas may grow large, but one cannot predict which idea might lead to a major breakthrough. Many big innovations actually did not come about by a ‘mega-aha’ in one leap; more often A has idea, this sparks a new idea in B, which in turn sparks idea in C, and all of sudden the accumulative effect becomes mega – even if the original idea A that set the chain off wasn’t all that good – nevertheless if A had not been allowed to linger, the subsequent mega idea might never have come about. So all Kaizen ideas initially should be treated equivalently. 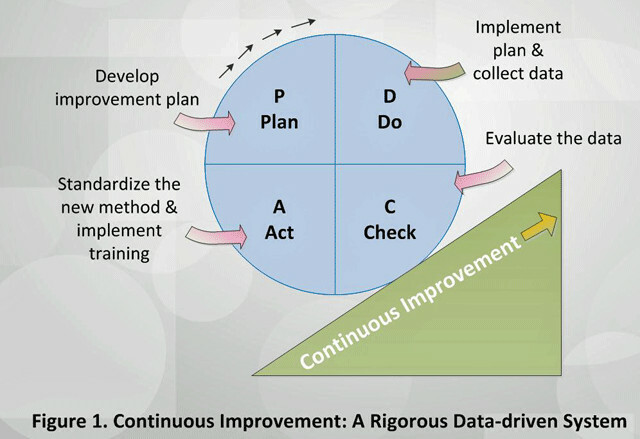 So, when should Kaizen be applied? All the time of course. By everyone, everywhere. But Kaizen is also particularly useful after a failed innovation (to break out of ‘failure’ mode, back to basics), as well as after a successful innovation or transformation (to sustain its momentum and make further improvements on it – and to prevent stagnation or hubris). This is why Caterfly proposes applying Kaizen as the third phase of an implementation or change program (agile, sociocracy, EMS/SMS), making innovation strategy. Although Kaizen was formulated in Lean, as a philosophy it can be applied to life, family, healthcare etc., in all kinds of contexts. This is why I prefer to treat Kaizen separately from Lean, as a pan-organisational attitude of small ongoing innovations. Yes, Lean needs Kaizen, but Kaizen does not need Lean. I would argue that a Kaizen culture, however counter-intuitive Kaizen itself may appear for managers to implement, may be a better way to achieve change, engagement or innovation in an organisation, than many other interventions aimed directly at ‘change’, ‘engagement’ or ‘innovation’. Kaizen opens up communication, and enables an organisation to become more responsive and adaptable to a changing world. Kaizen is a platform for continuous change and improvement, change towards a better emergent future. It is a platform for engagement, putting the organisation in the right mind-set to swim swiftly in the natural flow of change.